I don't know if anyone here has visited Canada before, or more specific Banff in the Western Canadian province of Alberta. I live near there and it never ceases to amaze me when I take day trips around the area and see what a beautiful space I live in. I love the mountains and the nature that exists there. Yesterday, I ventured out early with my dear friend and her visiting family. I told the young passengers that there is never a guarantee that we will see any wildlife, as times have changed from when I was a child and we would most certainly see something. BEARS!!! 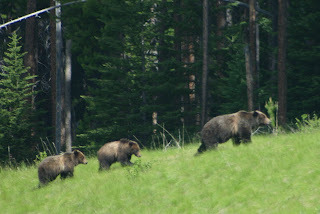 A momma and her two cubs (yearlings and very large!)! A very exciting day, indeed!